Zinnias are such perfect summer flowers, aren’t they? They grow and blossom and don’t need any special attention, just sunlight and water. I love having them all around my foundation and I love cutting them and bringing them in the house, too. It’s the first weekend of August – make the most of it! Zinnias are just great. Plus . . . bonus . . . they have a name that is just plain FUN to say! I love zinnias, too. Beautiful temperate weather at last– have a great one! We do not have any of those! Will need to investigate. I’ll beep on my way by, heading to Wareham! And they come in wonderful colors of summer! Happy Weekend, Carole!!! 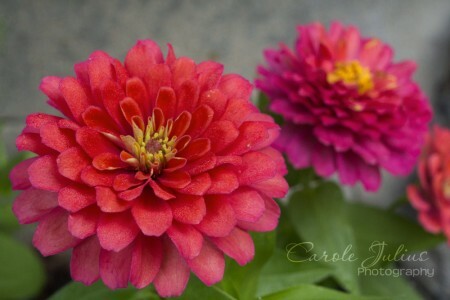 Your zinnias are so beautiful! I don’t plant them any longer…darn ants always chew them. Beautiful blossoms. Have a great weekend! Wonderful photo, Carole. I love the clarity of both color and texture. Happy weekend to you too! I can’t believe it’s August! Where is our summer going? Enjoy your weekend! Eye Candy indeed. One of my neighbors has zinnias in her front beds and I’m tempted to wander into her yard for a photo. Have a wonderful weekend! My grandmother kept a garden on the farm that had about the same footprint as a (large) ranch house. The longer side that bordered her lawn featured a full-length row of Zinnias, which she cut for table bouquets. I wonder how many seed packets of Zinnias she purchased each spring? Beautiful eye candy as usual! Third blog in a row that has me tempted to paint flowers. First daisies, then lilies, now zinnias. It’s an escape just like knitting. I want to try and paint everything.